The most common home remodeling of the last few years is bathroom related, with 81% of people undertaking a project there. Bringing grout and tiles back to life must be on any remodel task list. Dirty grout will catch your eye every time you walk into the bathroom or get in the shower. Years of use leaves black mold, which holds bacteria. You may clean the grout regularly, but you can’t remove the mold. This can be a big problem when moving to a new home or maybe looking to sell your old one. Never fear as we at the Grout Medic are here to help. After a grout cleaning and grout sealing session from us, your bathroom will look great. The following are three ways the Grout Medic can bring your grout and tiles back to life. Our expert technicians have seen it all during their many years of service and know how to tackle any job. After the grout cleaning, it will be free of the bacteria and mildew which leads to the black color you see between the tiles. Mold builds up over time and is impossible to remove safely with household chemicals. This is where the Grout Medic comes in. We use green vapor technology for grout cleaning in the bathroom, steaming away the dirt and restoring the original white. Though you may not notice the clean grout, you and guests would definitely see the mold. By the time we finish the cleaning, your bathroom will look like new again. Your grout will be chemical free and safe for the family for many years to come. The bathroom tiles can hold as much dirt and bacteria as the grout does. The shine will go off them without you noticing and they may even be sticky to walk on in your bare feet. Your tiles will look even dirtier when the grout is clean, so don’t forget the tiles. Ask about both jobs when getting an estimate on the grout cleaning. The Grout Medic technician will get to work steaming the layers of mold and bacteria away, almost like magic before your eyes. You will be amazed at how the tiles gleam once we clean the bathroom and wonder why you didn’t tackle them earlier. The bathroom sees a lot of foot traffic, as well as make-up, dirty clothes, spillages, and muddy dog prints. Regular cleaning from the Grout Medic will bring the grout and tiles back to life, back to how they should be. Grout is a porous substance. It will soak up the water, steam and all those cleaning products that make you smell so nicely every day. The same ingredients which lead to build-ups of mold and bacteria. The warm, damp conditions in your bathroom only encourage the growth. Once the Grout Medic cleans the bathroom get them to apply a layer of grout sealing. This will stop the grout from absorbing the products that cause all the dirt and make it resistant to stains. Our grout sealing service is fast and efficient and should be done regularly as part of an overall bathroom clean. 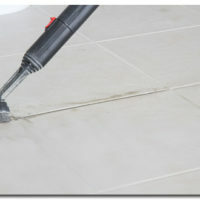 Grout sealing also strengthens it, stopping the grout from chipping and even falling out. Missing grout undermines the tiles, causing even more problems. Have a look around the bathroom. If the grout and tiles need cleaning, and they probably do, then call the Grout Medic. Our technicians know how to bring your bathroom back to life. Call us today or visit www.groutmedic.com for a full list of our services.